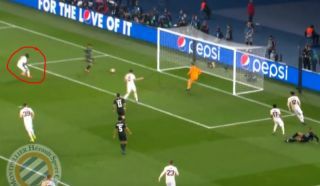 Manchester United fans are not at all happy with how Eric Bailly is playing as he fell asleep for Juan Bernat to equalise for Paris Saint-Germain this evening. Romelu Lukaku had given the Red Devils an early 1-0 lead on the night, but it’s now 1-1 and 3-1 to PSG on aggregate after their 2-0 win at Old Trafford in the first leg of this Champions League tie. Bernat finished well from a flowing PSG move, but if you watch carefully, Bailly had him marked before completely missing his run ahead of him to the far post to tap home. Bailly an absolute liability for @ManUtd getting destroyed on that side ? ?